FILE - A boy walks on a street littered with cooking gas cylinders after a fire and explosions destroyed a nearby gas storage during clashes between fighters of the Popular Resistance Committees and Houthi fighters, in Yemen's southwestern city of Taiz, July 19, 2015. Not even hospitals are spared the shells which every day pound the besieged city of Taiz, where Yemenis who took to the streets for democracy during the "Arab Spring" now just struggle for survival. Yemen's third largest city is at the mercy of thousands of Houthi militiamen allied to former president Ali Abdullah Saleh, the man whom local people rose up against in 2011. Residents accuse the militias of blocking food aid and bombarding neighborhoods indiscriminately as they battle to take Taiz in a seven-month-old civil war. Despite stepping down in 2012, the ex-president still has the support of many in the army, and the people of Taiz believe they are enduring a collective punishment by the militias and Saleh loyalists for their past opposition activism. "Every day we suffer shelling by howitzers and Katyusha rocket attacks - not just on our resistance forces but on civilian areas, homes, hospitals, markets and drinking water taps," said Tawfiq al-Sha'bi, head of the city's Lawyer's Union. "Their goal is to put us on our knees, because the people of this city refused to accept that an armed group could take power in this country by force, and because we were the first to rise up against tyranny in 2011," he told Reuters by telephone. Of the more than 5,600 Yemenis killed in the civil war, medics in Taiz say more than 1,600 have died in the city which was once renowned for its cosmopolitan culture. Residents overwhelmingly blame their besiegers. However, a Saudi-led coalition has intervened in the civil war against the Houthis who are allied to Iran, and daily strikes from its jets have also allegedly killed many civilians. The Houthis cast themselves as revolutionaries fighting corruption and call their opponents in Taiz and elsewhere around Yemen mercenaries in thrall to the West and Gulf Arab powers. Saleh says he is independent, though his critics accuse him of helping to direct army loyalists to settle scores and win back some of his old powers. Saudi Arabia and its Gulf Arab allies intervened in March on behalf of the Yemeni government that had been driven into exile by the Houthis, viewing the group as a proxy of their regional arch-rival Iran. But despite hundreds of Arab air strikes throughout the country, the conflict is largely stalemated; Taiz remains split between Houthi-Saleh forces and pro-government gunmen fighting for every inch of the green, hilly city. Houthi forces control the entrances to the city, and residents say their checkpoints search incoming cars not just for weapons but for fuel canisters, flour and other mainstays. Firewood is smuggled by donkey over the mountains which ring the city to cook family dinners, and when a water truck managed to clear the blockade last month, dozens of desperate residents set upon it with empty jerry cans. The International Committee for the Red Cross said this week it had been negotiating for the entry of basic medical supplies, including oxygen pumps, for over two months but to no avail. Abdurraheem al-Sama'i, a local doctor, said the people injured by the shelling got little help inside city hospitals bereft of supplies and subject to repeated bombings. "The health sector has completely collapsed. You see people dying of pain from the worst possible wounds in front of you, and you can't even provide the most basic comfort," he said. "On Sunday, 13 rockets hit the main al-Thawra hospital. Just yesterday, two mortars hit the gates and killed two men," he added. "When no target is spared like this, I don't call this indiscriminate, I call it deliberate." 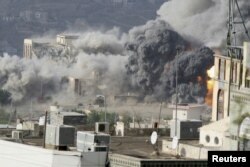 FILE - Smoke billows during an airstrike on the Republican Palace in Yemen's southwestern city of Taiz, April 17, 2015. Video has emerged of a boy in hospital last month being treated after he and his friends were wounded by a falling shell while playing. Wincing in pain, six-year-old Fareed Shawki pleaded to doctors, "Don't bury me!" Succumbing to his wounds, Shawki was buried days later, further undermining the morale of residents who face daunting problems even if the Gulf coalition forces make good on their promised to eventually "liberate" the city. Al-Qaida in the Arabian Peninsula, the global militant group's most potent branch, announced this week that it was fighting alongside other local militias to eject the Houthis from the city. Until now, al-Qaida had not been known to operate in Taiz. The city now risks suffering the same fate as the port of Aden further south, which was wrested from the Houthis in July but quickly descended into chaos and now teems with armed men, including Islamic State militants. "It's a threat if the conflict drags on much longer," said Nadwa al-Dawsari, a Yemeni analyst originally from Taiz. "With the government absent for so long and the fighting ongoing, it's almost inevitable that unwelcome people in the form of these extremist groups could come to Taiz," she added.